Shelby Miller Injured on Second Pitch of Game, Carlos Martinez to be Called Up? BREAKING: As was discussed prior to the news being made official, Carlos Martinez has indeed been called up to start Thursday’s series finale against the Dodgers (via @LangoschMLB). SHELBY UPDATE: As of 10:30 AM CT, it appears that Miller will avoid the disabled list at this time (via @LangoschMLB). On just his second pitch of the game, Shelby Miller was injured on a comeback line-drive off the bat of Dodgers’ leadoff man, Carl Crawford. The liner struck Miller in his throwing elbow–ricocheting over David Freese into short left field for a double. 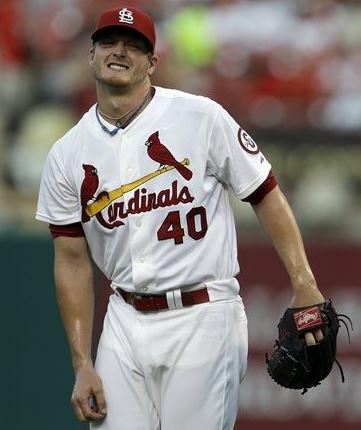 According to Jenifer Langosch and the St. Louis Cardinals, Miller has been diagnosed with a right elbow “contusion” after x-ray came back negative. This can be seen as good news considering the speed at which the ball came off Crawford’s bat. In short, a “contusion” is basically just a bruise, so expect Miller’s elbow to be black and blue tomorrow. However, if you want a more in-depth definition of the injury, I provided one below. Thus, it looks as if Miller is headed to the disabled list. If it truly is just a contusion and no complications arise, this very well may end up being a “blessing in disguise” for the Cardinals. Before tonight, Miller was on pace for nearly 175 innings pitched this season. As a rookie who is widely considered the Cardinals’ number two starter, the team needed to start limiting his innings in some manner. Sure, I do not wish an injury on any player, but as long as this one remains minor, then this may be the perfect time to give Miller the rest he needed. Get well, Shelby, but in the meantime, let’s hope Cardinals fans can get a taste of the future with Martinez in the big league rotation. Miller needs the rest, and Martinez needs the experience. If any injury can ever be considered a good one, this just may be it…as long as Shelby returns fully healthy in a few weeks. This entry was posted in St. Louis Cardinals and tagged Carlos Martinez, Miller, Shelby Miller, St. Louis Cardinals by stlcupofjoe. Bookmark the permalink.